Prior to 1895, poor relief in Aberdeen was divided between two parishes: St Nicholas, to the east of Den Burn, and the more well-to-do Old Machar to the west. In 1847, the two parishes briefly agreed to set up a joint poorhouse for the city. However, after failing to reach agreement on the scheme, the parishes proceeded to operate independently. It was only in 1895 that the two parishes were united for poor law purposes and administered by the Aberdeen City Council. 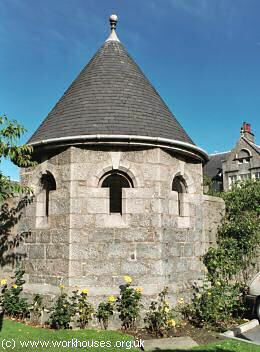 The St Nicholas Poorhouse stood at the north side of Nelson Street, Aberdeen. In 1847, the Board of Supervision for Relief of the Poor published a model poorhouse plan "originally prepared for the united Parishes of St Nicholas and Old Machar, Aberdeen, and is now about to be erected with some slight modifications, for the Parish of St Nicholas". A bird's eye view of the model poorhouse, designed by architects Thomas Mackenzie and James Matthews, is shown below. 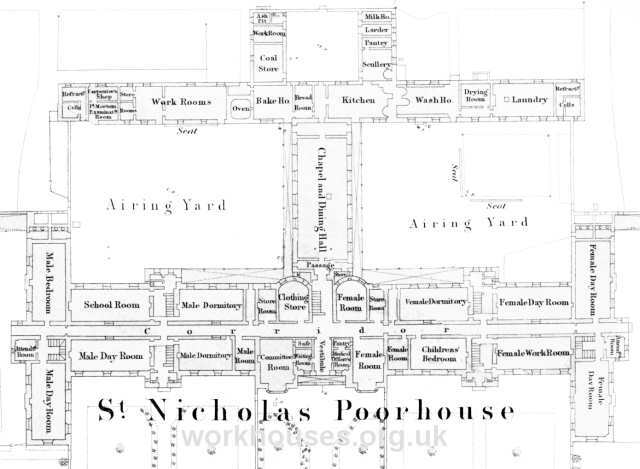 A ground-floor plan of the main building of the St Nicholas poorhouse from the 1860s is shown below. Females were housed at the east of the building and males at the west. 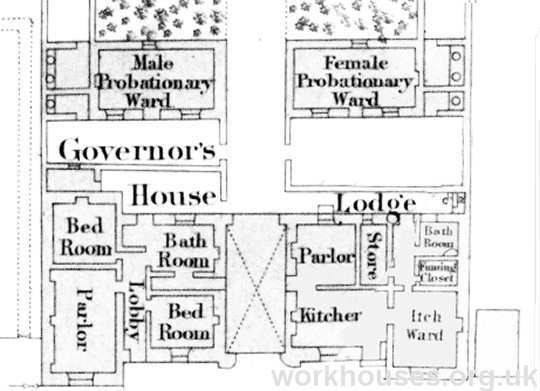 The entrance block contained a porter's lodge, probationary wards for new inmates, and the governor's quarters. The buildings were sold in 1908 following the opening of Oldmill Poorhouse (see below). The Nelson Street site was later used for St Peter's Roman Catholic School, now demolished. Old Machar operated a poorhouse, location unknown, from around 1849, with accommodation for 47 inmates. A new poorhouse, capable of housing up to 200, was erected in 1853 at the north side Fonthill Road, Aberdeen. The building was designed by William Henderson. The new poorhouse's location and layout are shown on the 1890s map below. In 1907, the Board of Supervision published extracts from the previous year's annual report by the poorhouse's governor, Mr W.G. Jonstone. The male patients are employed in cutting and bundling firewood, making clothes-pins for sale, delivering the same to shops in town by hand-carts, scrubbing and cleaning the yards on the male side of the house, keeping, the garden, and attending, to the pigs. The female patients are employed in the wash-house and laundry, scrubbing and cleaning the wards on the female side of the house, making and mending all the female clothing, knitting and. mending all the stockings for the house, also supplying a quantity of stockings to the Inspector for the outdoor poor, and assisting in the kitchen and. dining hall. The firewood and clothes-pins industries are fairly profitable financially. Following the opening of Oldmill Poorhouse in 1907 (see below), the Fonthill Road premises were acquired by the Territorial Force Association and converted into barracks. The site has now been cleared and redeveloped for housing. 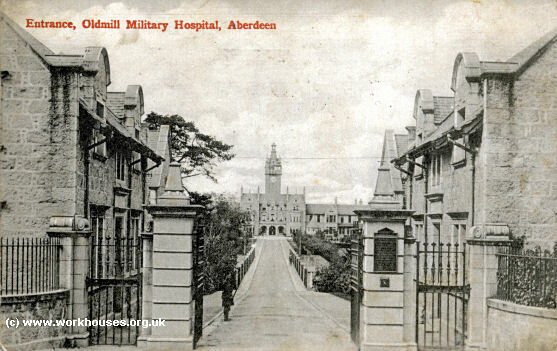 The new Oldmill Poorhouse was erected in 1904-7 on Skene Road, Aberdeen, on the site formerly occupied by the Oldmill Reformatory for Boys. The new building accommodated 961 inmates. Its location and layout are shown on the 1925 map below. Designed by Alexander Brown and George Watter, the new poorhouse for the united parishes appears in many respects to follow the model plans prepared 60 years earlier. The central clock tower is, however, somewhat more substantial than that in the original design. Former Oldmill Poorhouse, Aberdeen, from the south, 2001. The elegant rotundas at the corners of the front yards actually house inmates' privies. Former Oldmill Poorhouse, Aberdeen, privy from the south-east, 2001. The T-shaped main block would have contained the Master's quarters, committee rooms and clerk's office at the centre. 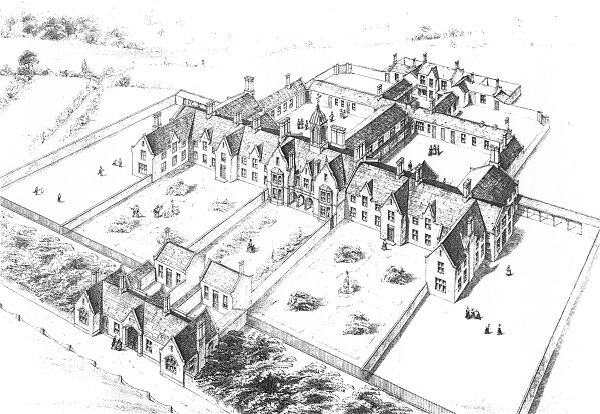 The two wings of the main block contained male and female accommodation, probably with the aged at the front side and able-bodied or "dissolute" inmates at the rear. Children's quarters were usually placed at the far end of each wing. Former Oldmill Poorhouse, Aberdeen, from the south-west, 2001. Former Oldmill Poorhouse, Aberdeen, from the north-east, 2001. 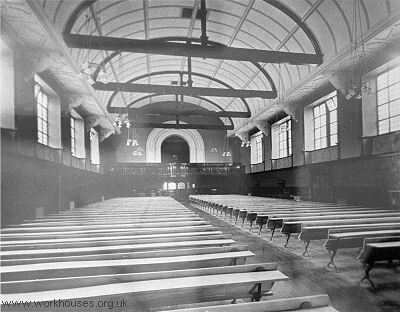 The centre rear of the workhouse contained the poorhouse chapel which also served as a dining hall. Former Oldmill Poorhouse, Aberdeen, chapel interior. An infirmary was erected to the north-west of the poorhouse. It contained a central administrative block flanked by male and female ward pavilions. Former Oldmill Poorhouse, Aberdeen, infirmary from the south-east, 2001. On the 11th december 1914, the children's block, which accommodated 116, was totally gutted by fire. The blaze started at 10.30pm and all the children were rescued. However, on 2½-year-old boy went back into the building and died. 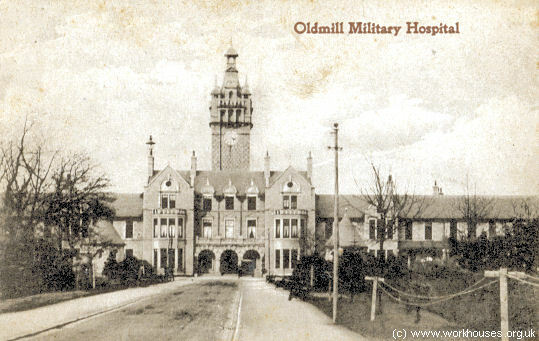 Between May 1915 and June 1919 Oldmill was evacuated and used as a military hospital, the patients and ordinary inmates being sent to other hospitals and poorhouses in the area. 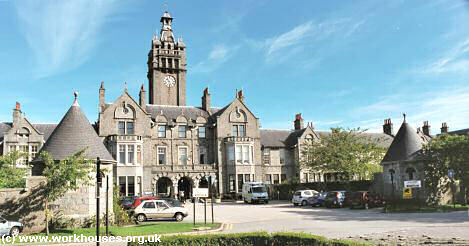 The site was taken over by the Town Council in 1927 and became Woodend Municipal Hospital. It was again used as a military hospital during the Second World War. The hospital facilities transferred to the National Health Service in 1948, although Oldmill Home, the former poorhouse block, initially stayed under local council administration. It eventually became the hospital's Glenburn Wing, now renamed Woodend South, providing care for geriatric patients. Northern Health Services Archives, Special Collections Centre, The Sir Duncan Rice Library, Bedford Road Aberdeen AB24 3AA. Holdings include: Administrative records (1896-1960); Admissions and discharges (1896-1960); etc. Mechanical Aberdeen by John Reid (Keith Murray, 1990).